Find out about damage, stats, rarity, and magazine size of the Shotgun weapon class in Fortnite! 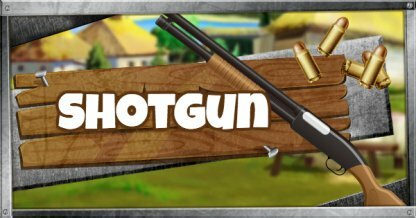 Shotguns are among the best choices for close range combat as its high damage per shot and area of effect simply makes it a formidable weapon up close. 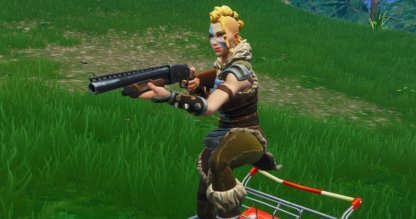 Shotguns become ineffective anything beyond mid range due to it dealing less damage when used in range. At mid-range, it is average at best. All Shotguns fire multiple pellets at once, providing a large area of effect. This makes it easier to connect shots with enemies. Fully expended Shotguns take between 2.7 to 6.3 seconds to reload, but partial reload takes less time. This can easily turn battles for the worse as enemies may take this reload time to their advantage. Take advantage of Shotguns' full potential by engaging enemies in close quarters. Keep your aim on their upper body so as many pellets as possible connect to the target. Jump up to prevent enemies from hitting you and shoot down at them in response. You can also get headshots through this, boosting your damage outputs! Use another weapon while at long range and chip away at an enemy's health and shields. Once you can rush in, swap to your shotgun to finish them off.